This Ecuador tour to Cuenca, the country’s most picturesque city, will transport you into the colonial history of the small yet immensely rich Ecuador. It is truly a delight to stroll down the cobblestone streets and admire the beautiful marble buildings and leafy plazas of this attractive city. This UNESCO World Heritage Site is also known as the “Athens of Ecuador” due to its long tradition as the birthplace of notable artists, writers, and philosophers. Nearby, the Cajas National Park will enchant you with its diverse landscapes full of lakes and ponds offering countless hiking opportunities and varieties of flora and fauna. From city scenes to beautiful nature, this Ecuador tour is perfect to discover the best of Ecuador in only 4 days, and can also easily be combined with a tour to some other great destinations in Ecuador. You will be picked up at the Cuenca airport by one of our Galapagos For Less representatives and taken to your comfortable Cuenca hotel. Depending on your arrival time, you can also opt for one of our optional excursions below to complement your Ecuador travel experience. Although Cuenca is Ecuador's third largest city, it still retains its pleasant provincial air. Red tiled roofs, cobblestone streets, flowery plazas, and numerous museums create a very pleasant, relaxing atmosphere and the city is considered by many to be the most beautiful in all of Ecuador. Today you will enjoy a city tour on your Ecuador travel to discover the beauty and charm for which Cuenca has been recognized as a World Cultural Heritage Site. A walking tour in the colonial downtown area of Cuenca will allow you to delight in the warmth and hospitality of its people, the colorful parks and plazas, religious monuments, and handicraft shops while learning about the city’s history. After your tour, you will have the rest of the day to enjoy at your leisure exploring the town or resting at your comfortable Cuenca hotel. Today you will depart from Cuenca for a tour of the lovely Cajas National Park along the way, located about 18 miles (30km) northwest of Cuenca. The park offers various activities that will meet the desires of each and every traveler. You can choose between hiking, fishing, bird-watching, viewing the rich and colorful flora and fauna, and more. You may also visit the Interpretation Center close to La Toreadora Lake – the largest lake of the park – where pictures and presentations of the reservation are displayed. After your tour, you will return to your hotel in Cuenca where you can enjoy your last evening at your leisure in the beautiful colonial city. After breakfast, you have the opportunity to take an additional Cuenca tour, or meet your transfer to the airport for your journey home or to the next destination on your Ecuador vacation. 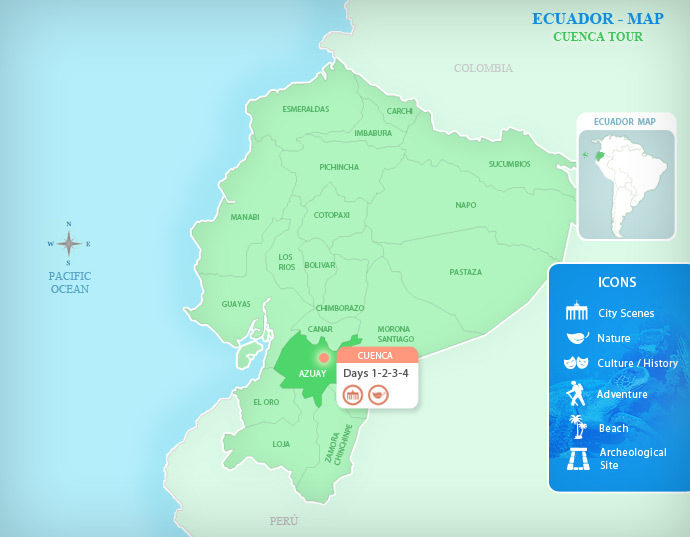 Browse our Ecuador travel destinations for ideas of where to head next. *Note: All our tours can be done in the reverse order as well. Ask your travel advisor for more information. Each of the luxurious rooms in Mansion Alcazar is uniquely decorated and furnished with antiques. The decor transports guests back to the mansion's origins when it was the personal home of an Ecuadorian president in the early nineteenth century. Try some of the talented chef's local dishes and enjoy a generous breakfast in the tastefully decorated restaurant. In the evening, relax by listening to the soothing sound of the fountain in the lobby, or have a glass of champagne by the baby grand piano. The top quality service and attention to detail in this Cuenca hotel, along with its central location near the main plaza, makes Mansion Alcazar one of the best accommodations in Cuenca. This newly renovated, colonial-style mansion is located in the heart of Cuenca. With its several patios, subdued lighting, and colonial style tiled floors, the hotel exudes a truly whimsical ambience. The comfortable and spacious 30 rooms, with their exquisite private facilities, are brightly and tastefully decorated. The colonial décor transports guests back in time while offering modern comfort. This Cuenca hotel is located just two blocks from the main square, a short walk from the many attractions and restaurants of Cuenca. Located in the center of Cuenca, the Victoria Hotel in Cuenca is built on the top of a cliff overlooking the Tomebamba River. Not only does it provide an ideal location for experiencing the sights and sounds of this charming city, it also boasts stunning views. The sheltered garden space offers a truly relaxing atmosphere with the pleasant sounds of birds chirping as well as bushes adorned with fragrant flowers. The hotel itself is quite charming, complete with a façade composed of a mix of bourgeois aristocratic brick and marble, and an interior adorned with typical elements of Cuenca culture. Enjoy the spectacular views from the restaurant's terrace while tasting the delicious local cuisine offered at their excellent on-site restaurant, El Jardin. *IMPORTANT: As this is a market tour, this tour package is only available on FRIDAYS and SUNDAY, which are the market days for these cities. After breakfast at your Cuenca hotel you will depart for the city of Gualaceo. Located in a beautiful valley approximately 20 miles (32 kilometers) outside of Cuenca, Gualaceo boasts a subtropical climate, rich folklore, and attractive handicrafts. The most important goods are Ikat woven articles and shawls embroidered by hand. In the main square travelers can observe locals in traditional dress making the famous Panama hats. For those looking for an authentic experience, friendly bartering is often part of the shopping process. Aside from being an opportunity to sell their goods, market days are often a festive social gathering for the community. Next, the tour continues to the city of Chordeleg, located just 10 minutes from Gualaceo. Chordeleg is known for a variety of fine jewelry, particularly the beautiful filigree jewelry that many artisans produce. At the market here you can also find woodcarvings, ceramics and fabrics. The artisans of this region also offer products such as the Ikat goods, shawls, ponchos, and embroidered hats. Surrounding the main square, shoppers can buy gold and silver of excellent quality for amazing prices. The entire experience will last approximately 8 hours. Included: Transportation to/from Cuenca, English-speaking guide. *Note: Pricing is per person and based on a private tour with a minimum of two travelers. For single traveler pricing, please consult with a Travel Advisor. IMPORTANT: This tour is available only on Wednesdays, Fridays, and Sundays. Considered to be the most important Inca ruins in Ecuador, Ingapirca is located along the Royal Highway that connected Quito with Cusco, Peru. Here you will be able to enjoy ruins that feature traditional imperial Inca architecture such as doorways with unique trapezoid shapes and tightly fitting stonework. The history of Ingapirca, however, goes even farther back than the Inca empire and the site was first used by the Cañari culture, before Inca expansion into Ecuador. Ingapirca is located approximately 1-hour by car outside of Cuenca and in addition to exploring the site with your expert guide, you will also enjoy a delicious lunch (included). The entire experience will last approximately 8 hours. Note: Prices are per person and based on a private tour with a minimum of two travelers. For additional tour options, please check with your Travel Advisor. IMPORTANT: This tour is only available on Wednesdays, Fridays and Sundays. The Devil's Nose or Nariz del Diablo Train is considered to be among the world's greatest railway engineering feats. The 12 km (7.5 mile) railway travels between Alausi and Pistishi includes several switchbacks and zigzags along the mountainside. During the train ride you will pass by several small villages and enjoy incredible views of the Andean landscape. The starting point for the Devil's Nose Train is located approximately 3 hours outside of Cuenca by car. Next, explore what is considered to be the most important Inca ruins in Ecuador, Ingapirca. The ruins feature structures with imperial Inca architecture similar to that found in Cusco, Peru and the history the of the site extends beyond the Inca influence back to the Cañari culture. During the day you will be able to stop for lunch (not included) and will return to your hotel in Cuenca in the late afternoon. The entire experience will last approximately 8 hours. Note: Prices are per person and based on a private tour with a minimum of two travelers. For additional tour options, please consult with your Travel Advisors.